Grand Plaza is a mixed-use building with two residential towers atop a podium comprised of retail, parking and common areas. The building, which houses 764 units, comprises one square block in the heart of Chicago’s River North neighborhood. Amenities include a Club Floor featuring a library, business center, billiards and game room, fitness facility, spa with whirlpool and resistance pool, and landscaped terrace with outdoor pool, barbeque area, running track and golf putting greens. Both residence towers are topped with 6 floors of duplex apartment homes featuring fireplaces and dramatic two-story living rooms. 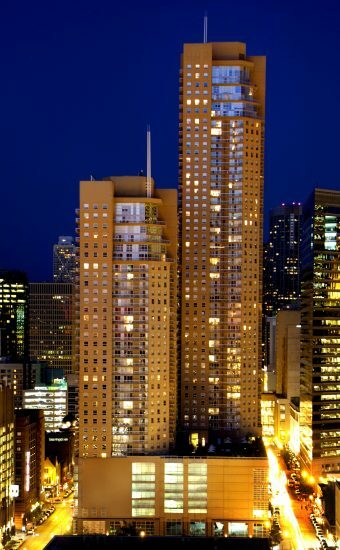 In 2004, Grand Plaza was the recipient of the Greater North Michigan Avenue Association’s Development of the Year Award and the National Apartment Association Paragon Award for best high rise community.